Our second open day took place a few days later on Saturday 28th June and over 250 people braved the dreadful weather to join us. We continued many of the activities that had been so popular with the children from Marcham Primary School a few days before. We were also delighted to be joined by craft specialists who demonstrated how everyday items were made in the Roman and prehistoric periods. Members of the local Weaving Guild showed us ancient weaving and spinning techniques and helped our visitors weave short lengths of wool to make their own traditional woven fabric, which many then wore as a decorative bracelets. 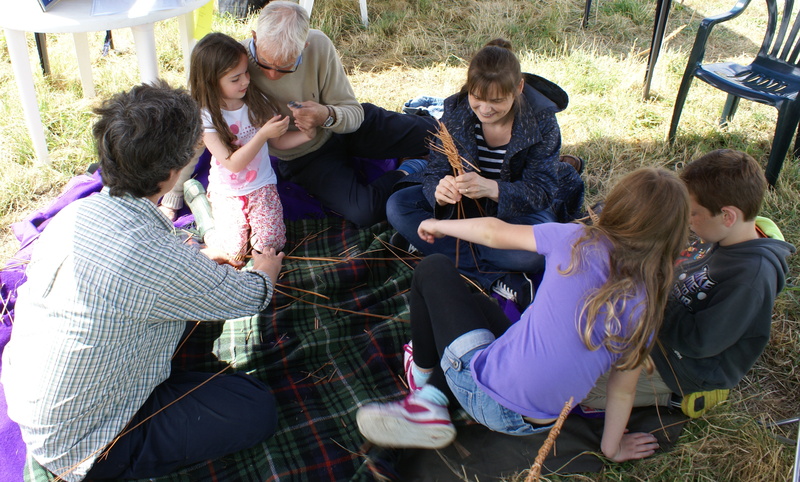 A basketry expert was also on hand to show off her skills, and many of the children came away with magic wands or amazing basketry fish they had created themselves. 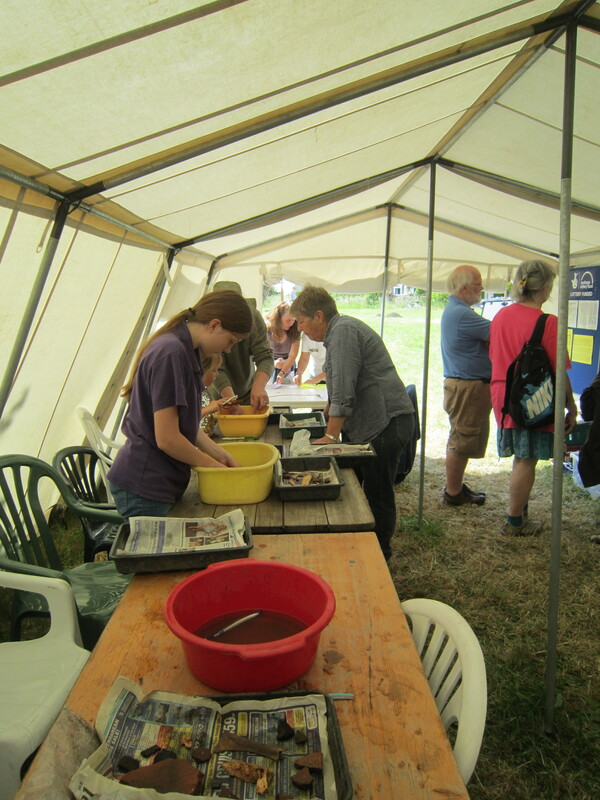 A stand where visitors could see a whole range of worked flint tools from Mesolithic to Roman times and discover how they were made, was run by one of our volunteers. We were also joined by members of the Marcham Society whose displays of historical research from the medieval period into modern memory, extends the story of Marcham beyond that revealed by our excavations. A trip to the Roman food and drink stand was a must for everyone (members of the Trendles Project team were frequent visitors!) 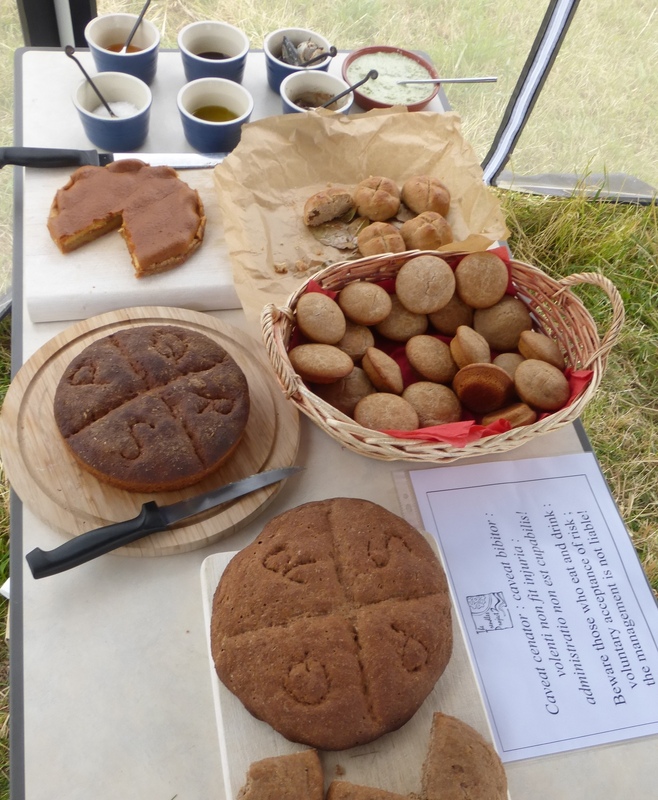 Simon had once again prepared a delicious range of authentic Roman foods including honeyed wine, un-leavened and honey bread and various Roman dips. The food not only tasted delicious but the historical background information and explanation of how they had been recreated was fascinating. Simon’s latest recipes can be downloaded here. The Trendles Project is of course about the eleven seasons of excavation carried out at Manor Farm and the work of our volunteers in making sense of the finds and records. A number of exhibition boards showed what we are doing in our Heritage Lottery-funded project, and other boards and finds from the excavation revealed various aspects of the excavation. To accompany these, talks by Project Director Gary Lock were filled to capacity with interested visitors. Some of the unprocessed Iron Age and Roman of pottery from the excavations was also available for ‘pot washing.’ This was especially popular with our younger budding archaeologists who enjoyed seeing the detail of the pottery fragments appear as they learned to gently clean the dirt away. It was also an opportunity to have a finds identification day where local people are encouraged to bring any objects they have found locally for identification. A Bronze Age socketed axe; a tiny bronze figurine, possibly Roman, 18th and 19th century coins and trade token, and pottery from the Roman to the post-medieval periods were all seen during the day. The day was a resounding success thanks both to the hard work of our volunteers before and during the open days, and to everyone who braved the weather to come and find out what our project is all about.